Our relationship with 1/3 of the Coma “Gang” started over a year and a half ago, through a chance encounter in another country. Upon successive visits to Capçanes, we’ve gotten to know Antoni, Cesc and Jordi more and have been enjoying watching their progress in creating their red wine Coma (which means “comma” in Catalan, or a valley, not the medical condition) year after year. 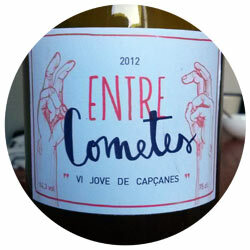 With the last harvest, they decided to produce a young wine with a faster release time, thus the “Entre Cometes” or “in quotes” that we had the fortune of picking up from Cesc when we met had another chance encounter with him up in Tàrrega (Lleida province) as this relationship transcends the borders of Priorat. Despite being a young wine, they’ve managed to treat it as a proper product and had the always wonderful Marina Capdevila design the label. The end result is an approachable, hearty wine that we most definitely would be happy to drink again if we can get our hands on another bottle. Unfortunately, they only make a couple of barrels of them.